Aug. 29, 2018 3:45 p.m. Icy, spicy, robust and refreshing … the Bloody Caesar is as comfortable on date night as it is at a backyard barbecue. Its satisfying tomato base makes it a great choice from the beverage cart on a transatlantic flight, its crunchy garnishes help stave off hunger pangs and it’s also the ultimate hangover cure. Considering all the flavour and versatility of the Caesar, it’s no surprise that Canadians consume 350 million of them annually, according to the makers of Mott’s Clamato. Invented in 1969 by Walter Chell, a barman in Calgary, Alberta, the Caesar may, in fact, be more Canadian than poutine or even maple syrup. And, with the exception of some border cities, it’s impossible to find a Bloody Caesar outside of Canada. “I was at a food event in Chicago recently, and no one had heard of them,” says Jim Walmsley, owner of Jam Café. The drink’s popularity is tied to its simplicity. Caesars are easy to make, even for amateur mixologists. For the classic version, rim one highball glass with celery salt, add a scoop of ice and season to taste with Tabasco, Worchestershire and a few grinds of fresh salt and pepper. Add one to two ounces of vodka, eight ounces of clamato juice and garnish with lime and a crunchy stalk of celery. Easy! Nearly 50 years after its introduction, the Caesar continues to evolve. On a tasting tour of five local eateries, I discovered some tantalizing twists on its classic elements. Creative garnishes, for instance, are making the Caesar more of a signature experience for restaurants. Now — here’s a look at some of the inventive Caesars you’ll find around Victoria. • The Double Seafood Caesar from Bartholomew’s Pub offers a tasty Montreal steak seasoning rim and an over-the-top assorted seafood garnish. The double Caesar is made with Mott’s Clamato juice and Wyborowa vodka, but the best part of the drink is its appetizing crown. Two chilled prawns, a cooked mussel on the half shell, two pickled beans, a lime, a lemon, two olives, a pickled pepper, a gherkin pickle and a cherry tomato (!) crowd the top of this Caesar. • A restaurant that specializes in pierogies may seem like an odd place to find one of the best Skyy vodka Caesars you’ll ever taste. But that’s exactly what you’ll find at SüLT Pierogi Bar. 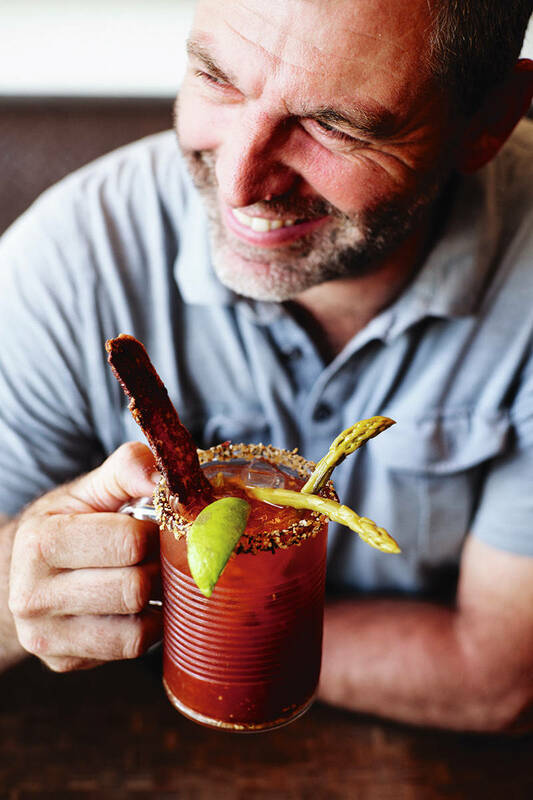 From its celery salt, garlic powder and chili flake rim to its housemade clamato juice and 12-spice blend seasoning, this is a craft Caesar like no other. Its complex, ginger/lemon forward flavours are enhanced with a garnish of fragrant, fresh-plucked Thai basil, chewy, homemade beef jerky and house-pickled vegetables. The pièce de résistance sits on a skewer on top of the drink — a warm, cheesy garlic pierogi, deep-fried to golden perfection. • Ferris’ Oyster and Seafood Bar’s Seafood Caesar is prepared in a tall, slim glass rimmed with a blend of celery salt and rich red smoky paprika. The cocktail mixes classic seasonings of Tabasco and Worchestershire with Sobieski vodka and Mott’s Clamato juice. Garnished with a single raw oyster that’s been dabbed with fresh horseradish and hot sauce, a chilled prawn, a spicy pickled bean and a piparra chili pepper, the sea-scented Caesar has a smooth, sophisticated flavour that complements this elegant dining establishment. • Jam Café complicates matters — deliciously — offering diners a choice of two sensational Caesars. The Classic Jam Caesar is rimmed with a coarse steak seasoning blend, augmented with a Chinese five-spice blend, then topped up with Stoli vodka, an in-house pickle juice blended with Mott’s Clamato juice and horseradish. The cocktail’s popularity at brunch is no doubt due to its creative garnish — a single piece of thick, sweet, house-cured bacon. Two spears of pickled asparagus and a lime add to the garnish, rounding out this sweet, briny and spicy drink. Sweeter still is the Bourbonator Classic Caesar, which swaps out vodka for Bullet bourbon, and adds some of Jam’s own apple barbecue sauce. Different? Yes — but delightfully so. The Bourbonator’s less subtle flavours leave a lasting impression. • Northern Quarter’s Caesar ups the ante with a smoked-paprika-and-Chilean-lime-salt-rimmed cocktail and a couple of important BC flavours: Walter Craft Caesar Mix from Vancouver and Sid’s craft vodka from the Okanagan. The restaurant recommends a two-ounce pour of vodka to compensate for the thicker, craftmade clamato juice, made from vine-ripened tomatoes, select spices and sustainably harvested clam juice. The Caesar is topped off with a slice of lime and a simple house-pickled green bean, and offers complex notes of garlic, mustard seeds and peppercorns. A very tasty cocktail. • Mottsclamato.ca Recipes, product information and lore from the original clamato juice producer. • Caesars: The Essential Guide to Your Favourite Cocktail by Clint Pattemore (Random House, 2014). The author and Mott’s mixologist offers more recipes and variations. • Waltercaesar.com: FAQs, where to buy information and more from the purveyors of the first all-natural craft Caesar mix.